Portraits in miniature continue to fascinate us centuries after they were painted. This finely executed hand painted portrait miniature of a beautiful woman of the nobility is one of the most exquisite I have ever seen. The painting is superb, with impressive fine details, the dress of this beauty is accented with fine luxury quality lace, her collar has buillon embroidery. Her hair is so exquisitely painted, with great attention to detail, she wears jewels in her hair, around her neck, even her collar has large gleaming pearls to frame her lovely face. The painting is signed by the artist on her collar. 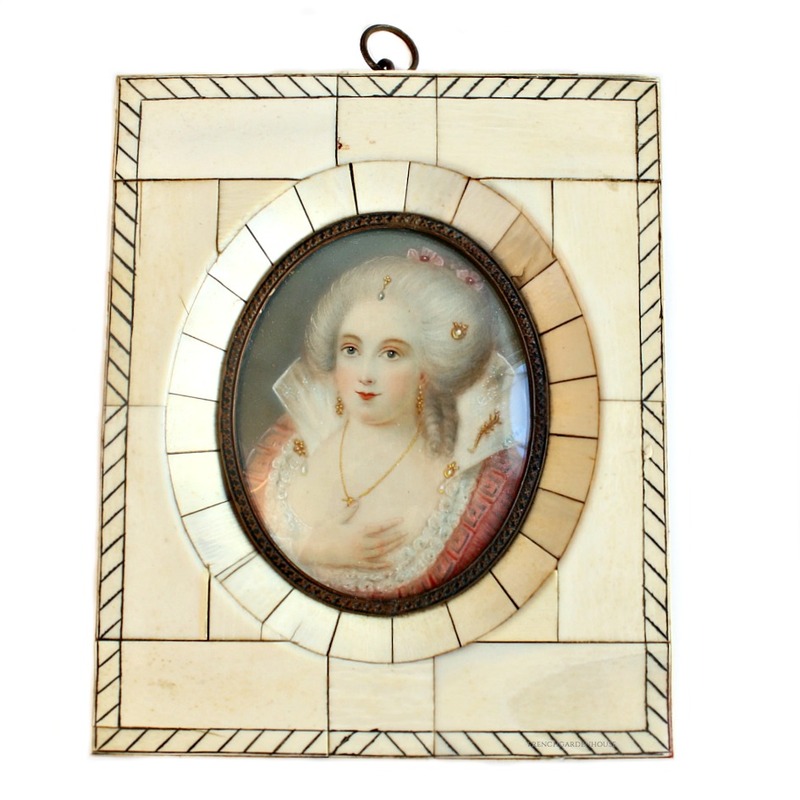 A highly collectible and decorative addition to your antique paintings and a delight to display with your fashion prints, or antique dresses, hats, parasols and all things delicious in your dressing room or boudoir. Mounted within a fine ormolu fillet, set in an bone paneled frame. Measures 4-3/4" x 5-3/4" x 1/2".